In fact, an industry source told CBSSports.com on Thursday that Haith is interested in the opening, and that he’d absolutely leave Miami if presented with a respectable offer. Furthermore, the source said former Alabama coach CM Newton — who is assisting the school in its search for Mark Gottfried’s permanent replacement — has privately backed Haith’s candidacy, meaning Haith is a realistic option if for no other reason than that Newton has tremendous influence at Alabama (and in the SEC, in general). Look, I understand that coaching at Miami is a tough job. Add in ACC competition, and I can understand that a good coach in that league could come over and look better in the SEC (at least this season). Yet one thing seems to bug me about Haith………..hmmm……. can’t put my finger on it… oh yeah, his teams at Miami haven’t been that great. The Hurricanes made the NCAA tournament last season (lost in the 2nd round to Texas), but not much else has happened down there. In fact, Miami brought back some core guys from that team, and ended up 7-9 in the ACC and out of the first round of the conference tournament. 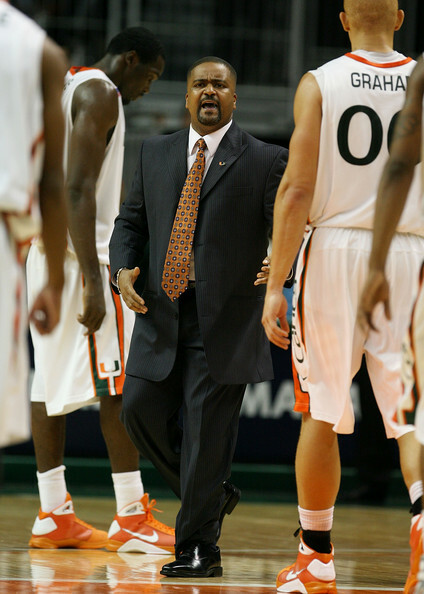 Coach Haith wants to prove that Miami can play with the big boys, so he wore his daddy’s suit. Why not go after Leonard Hamilton of Florida State? He’s been coaching basketball at a football school, and has connections to Dave Hart. It seems to me that Alabama could find a basketball coach with a better resume than Frank Haith. If Mike Anderson , Leonard Hamilton, or Anthony Grant tell you no, then I can understand looking at Haith. Yet it seems to me there are more coaches out there with more to offer (wether it be experience, excitement, or potential). So what say you? Haith or no Haith? The allegation against Alabama stand as Failure to Monitor (which means that one or two of our compliance people didn’t do enough on the front end to make sure who got what textbook). Honestly, I wonder why the heck we pay these people if they can’t get the proper controls to WORK! What started all of this was that certain student athletes reserved books and basic supplies under their names for buddies/ girlfriends/ boyfriends. They’d provide the list to the Supply Store, and would recieve their books. The key is that they didn’t sell the books, and would be charged cash if they did not return them. Now I doubt the 2007 textbook stuff will be that big of an issue…. at least in my head. Our players served their suspension and were reinstated by the NCAA. The problem comes with the 2005-06 date, which is under that window of repeat offender status. Personally, I expect a few extra years (2-3) of probationary status, which means we need to be extra careful near the Will Colliers of the world (you know, the types that ignore their own program’s wrong-doing in order to hammer the opposition to get an edge). Therefore, I think it would benefit the University of Alabama greatly to hire an outside auditing firm to externally analyze our NCAA compliance control system. I’ve been told the law firm we’ve retained can provide such services, but I did not see anything like that listed on their website. My friend at The Capstone Report did inform me that the SEC provides such an audit as well, but we all see how effective that turned out to be. Now for a little ranting, for venting purposes only…. Look, I understand we aren’t squeaky clean, like the rest of the SEC. Yet one question remains: why are we the only ones GIVING info of transgressions to the NCAA that they would have never known about in the first place? They could have dug, but that wasn’t a certainty. It’s not that I think we should have never played ball with them, but I wonder why the other SEC programs seem to get by without a single hiccup. Furthermore, if the NCAA hammers us hard for this, I will literally protest in Indianapolis, Indiana. I understand that we goofed up, but trying to make us the example YET AGAIN when other programs hand out free grades, homes for player’s families, and $100 hand shakes seems awfully rediculous. You have to wonder what the purpose of the NCAA actually is. We were a big name in history the last few years, but were not one of the marketable big names ala USC and Ohio State. It sickens me really. Yet the thing that is most absurd about this whole deal is that it happened at all. After all of the heart ache and pain from Albert Means, Mal Moore, the UA Administration and NCAA Compliance Dept. should have all gone over everything with a fine toothed comb to make sure UA was doing an impeccable job of preventing NCAA violations. I feel let down, but in the same time defeated because I feel as though there is nothing I’ll ever be able to do in the long run.